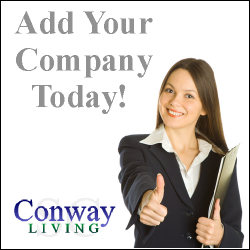 Add Your Company to Conway Living! There are a few ways that your company can become part of Conway Living! Our "Lifetime" Full-Page Company Profile with Directory Listing! Our Most Popular Option! We have made adding your company a lot better! We have a new "One-Stop" source for not only getting your company added with us on ConwayLiving.com but to also many other Conway websites and networks including, but not necessarily limited to, DiscoverConway.com, ConwayVIP.com, ConwayBusinessDirectory.com, and an option on many of our other grand strand area partner and sibling sites! Simply Visit The New ConwaySC.net to add your company! Sponsor A Page of any of the pages on Conway Living! If you see the This Space Available Ad on the right side of a page, you are able to sponsor that page with a 250x250 static image ad with a direct link to your website! Only $95 / year More Info / Sponsor Page Please note: You may select this option as a stand-alone option for your company -OR- as an addition to either #1, #2, or #3 above. If your company has a company profile with us, the link from your sponsorship ad will be directed to your company profile! Jobs in our Conway Jobs section! Products in our Conway Products section!